Long term chronic pain relief. In good hands at Riverbend. “I must have been one of Barbara’s first chair massage clients at CIGNA Corporation back in the early 1990’s. In more recent years I’ve come to appreciate the benefits of 1½ hour long Swedish massages as well as Energy Balancing. A weekly visit to Riverbend is my way of making sure I take care of myself. Massage undoes the kinks in my back and shoulders from too much office work and it has definitely enhanced my sports performance (volleyball). At Riverbend I always feel I am in good hands and so are my friends to whom I have given gift certificates. ~Cathy N., Bloomfield, CT.
“When I became pregnant I knew that I would be needing massage therapy and that the usual approach to pregnancy massage (laying on my side much of the time) might not be very relaxing for me if I had to brace myself against the therapist’s hands in order to get the deeper pressure I needed in my mid and low back. Barb’s method of combining chair massage, Swedish on an elevated back wedge and a good dose of foot Reflexology have resulted in medically safe, comfortable and effective sessions for both my baby and me. All I can say is….wonderful!” ~Stacey Hartley, South Windsor, CT.
From the lips of a “Scaredy Cat”. “Just wanted you to know that we had a spectacular time on our retreat day at Riverbend last week. Your therapists were great in that they made my co-workers and me feel right at home. This was my first massage because I’ve always had ‘issues’ with the idea of receiving one. Now I am a ‘believer” because my therapist was so professional that I never once felt self- conscious. You and your staff provide a wonderful service!” ~anonymous. 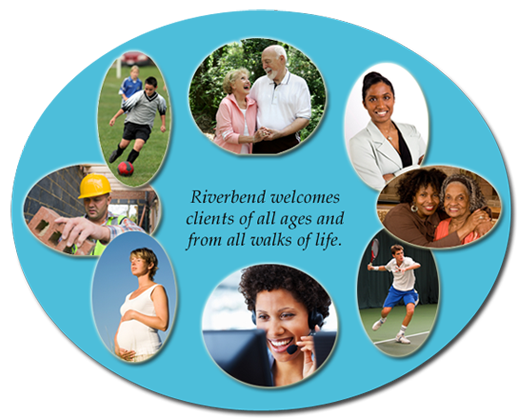 “I’m an experienced receiver and I must say that Riverbend is one of the best places to get massage. They personalize your massages to meet your particular needs and many of their therapists are highly skilled in several types of bodywork. Riverbend is a wonderful experience.” ~Gail M., Bolton, CT.
~Ken G., Broad Brook, CT.
Get your bearings after massage. “Sometimes I just can’t wait to get to your office. I actually feel better as soon as enter your waiting room and shut the door on the world outside. I can always count on a great massage there and appreciate being able to enjoy a leisurely cup of tea in one of your rocking chairs before I drive home after my session. It’s good to “get your bearings” before getting behind the wheel!” ~Beverly R., Vernon, CT.
A date with a “Reluctant Dragon”. “A couple of years ago my wife gave me a gift certificate to get a massage because I’d been working really long hours and she said it was “beginning to show”. Not convinced this was something I wanted to do, I put it off and put it off until one day she made the appointment for me and practically dragged me there. I felt so good afterwards that I couldn’t even stay mad at her. Now we give each other Riverbend gift certificates and sometimes have Saturday nite ‘massage dates” at Riverbend. Makes MY shopping easy!” ~Roberto F., East Hartford, CT.
“My friend goes to you and when she suggested that I come too, I said I couldn’t afford it. She gave me one of her Frequent Sigh-er discount cards to use the first time and now we do “Girls Night Out” once a month. (We work hard and deserve it.) Thank you for making massage so affordable.” ~Jessica F., Glastonbury, CT. Benefited by receiving massage on a regular basis. “I’ve been receiving Riverbend massages for 10 years, first at my place of work and then at their office. My wife has become a regular there also. We both realize the great benefits of receiving therapeutic massage on a regular basis for our overall health profile. I’ve even had specific ailments/injuries that the therapists have “fixed”. Barbara has assembled a fine team of therapists who are able to address your specific needs and I highly recommend them, especially to those who I know would benefit from a regular regimen of therapeutic massage.” ~Ted H., South Windsor, CT.